Class Summary: In this course students will explore the world of electricity! 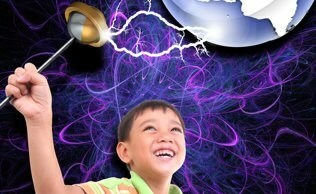 They will learn all about sparks and static electricity by experimenting with a Van de Graaff generator. In addition, they will get to conduct an experiment in which feathers are made to levitate through the concept of static electricity. Towards the end of the course they will get to assemble a Static Stick to bring home and continue the hair-raising fun! Educational Value: This exciting class introduces young scientists to the properties of electricity and electronic charges. Throughout the course students will learn the many differences between electrical currents and static electricity. They will explore the science behind electricity through several hands-on experiments including an activity where students are able to charge and discharge objects using static electricity.